Scientists believe the reason so many male mammals don't get involved in caring for their young is because they get higher "returns on investment" if their energy is spent seeking out more mating opportunities rather than actively parenting. Simply put, male mammals that spend their time producing more infants rather than taking care of the ones they have will leave behind more offspring. Over time, natural selection favours males who use this strategy, so fathering behaviour rarely gains an evolutionary foothold. Though mountain gorilla groups are full of complex social dynamics, just as human families are, in many groups some of the strongest social bonds we observe are between adult males and infants – even when the infants aren't the males' own offspring. From the time that young gorillas are old enough to move away from their mothers, they follow males everywhere. Males, in turn, are extremely tolerant. Some regularly hold, play with, groom, and let infants sleep in their nests with them. In a recent study, my colleagues and I set out to determine why this might be the case, since this behaviour didn't seem to only benefit their own infants. We found that the gorillas who spent the most time with any young, not just their own, also sired the most infants. This is a notable finding, since mountain gorillas are not a species in which scientific theory predicts this sort of behaviour, much less a connection to the males' eventual reproductive success. They have the behavioural and physical characteristics of a species where males are expected to invest their energy in finding mating opportunities, not bonding with infants. For our study we used 30 years of genetic paternity data to determine which males sired which infant, and compared that to hundreds of hours of data on their behaviour. We recorded what percentage of each male's time he spent grooming and resting with infants. In total, we included data from 23 males, who collectively sired 109 infants. This is a surprising finding. When we observe paternal care among mammals, the vast majority of the time it is in species that are monogamous – that is, males only mate with a single female, and vice versa. Gorillas are not monogamous, and the males' very well developed characteristics for fighting (like large muscles and teeth) suggest that their primary strategy is to fight for new mating opportunities, not to care for infants. 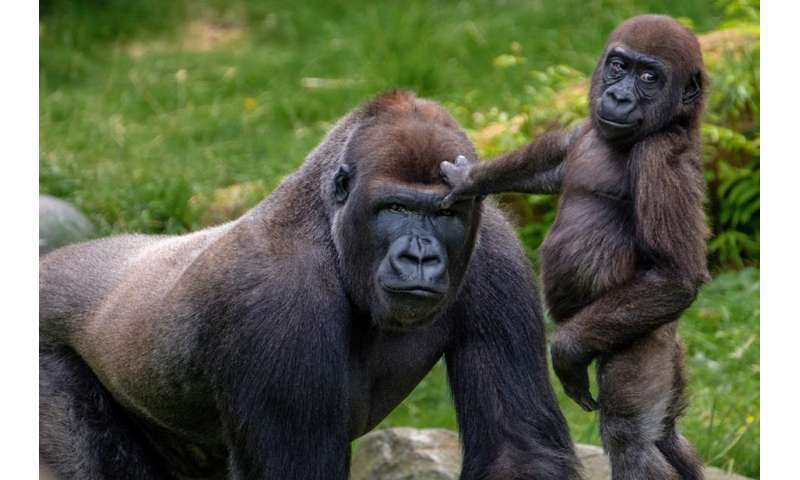 Though we cannot be sure exactly why the males who care more for infants fare better than their peers who don't, our best guess is that female gorillas prefer to mate with the males who are nicest to infants. There are other possibilities that need to be explored, however – for example, maybe the males who have personalities that females like are also more inclined to interact with infants. Regardless of exactly how the connection between males' relationships with infants and their reproductive success occurs, if males who have the strongest social bonds with infants are also leaving behind the most infants, then we would expect that over time a larger and larger proportion of male gorillas would engage in this kind of behaviour.